Tun Dr. Siti Hasmah binti Haji Mohamad Ali is perhaps the most prominent Malaysian woman for her personality and because she is the wife of the former Prime Minister of Malaysia, Tun Dr. Mahathir Mohamad, who was also the longest serving prime minister of Malaysia.Tun Siti comes from the state of Selangor where she was born in Klang in 1926 where she was oneo f the first Malaysian women to studied in a medical course when she enrolled at the then prestigious King Edward VII College of Medicine in Singapore where she would then obtain her MBBS from the University of Malaya in Singapore in 1955. After that she was involved with the health service with the government where she was one of the first Malaysian woman doctors then. She would then become the first Malaysian woman to be the Medical Officer in the Maternal and Child Health Department before becoming the State Maternal and Child Health Officer, also the first woman to do so. Since then she has written countless articles on family medicine and the socioeconomic factors in the areas of maternal health in the country. In 1981, when Dr Mahathir became the prime minister, Tun Siti Hasmah became the First Lady of Malaysia where she would then continue working towards improving women’s health and wellbeing. She led various medical associations where she would be actively involved primarily in health of women and family planning around the country. As the First Lady, she was well-known for her genuinely and sincere caring personality where she was treated with utmost respect wherever she goes. Apart from that, she was also very much involved in the promoting of rural women in Malaysia where she was part of the 6 members of the Core-Group Initiators of the First Ladies that represented the Asia-Pacific region at the First Ladies Summit for the Economic Advancement of Rural Women in Geneva. 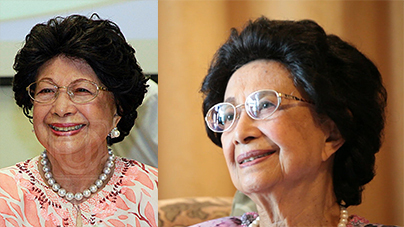 Although Dr Mahathir is no longer the Prime Miniter, Tun Siti Hasmah is still a highly respected woman in Malaysia where she still holds an important place among Malaysians and the people around the region.